We’re still emailed quite often and asked to explain the different types of touchscreen displays. So, with that in mind, we’ve decided to provide a simple guide. 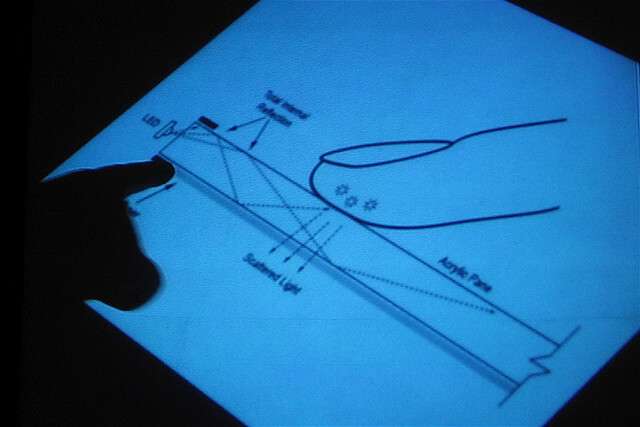 A touch screen has the ability to detect a touch within the given display area. It is made up of 3 basic elements, a sensor, a controller and a software driver. All the variants of touch screen technology carry their own distinctive characteristics, with individual benefits and limitations. Resistive touch screen can be divided into 4, 5,6, 7 or 8-wired models, which differentiate between the coordinates of touch. As one of the most commonly used, resistive touch screen relies on a touch overlay, constructed by a flexible top layer and rigid bottom layer, divided by insulating spacer dots. The inside surface is coated with a transparent material (ITO) that makes electrical contact when pressure is applied. These voltages are then converted to X and Y coordinates, which are sent to the controller. Whilst resistive screens are durable and easy to integrate, they can only offer 75% clarity. Commonly utilised for industrial purposes, capacitive touch screens consist of a glass overlay, coated with a conductive material such as Indium Tin Oxide. Contact with a capacitive screen creates an electrostatic charge that sends information to the touch control in order to perform its function. This type of touch screen has very good clarity and durability, except they can only respond to the touch of a finger or special gloves unless it is capacitive charged. SAW touch screen technology is based upon two transducers and a reflector placed on the glass surface. The waves are dispersed across the screen by bouncing off the reflector arrangement and received by the transducers. The touch is detected when the waves are absorbed. In comparison with the other touch screens; SAW provides superior clarity, resolution and durability, with the ability to interact with a stylus or gloves. Unlike the other types, infrared touch screen technology does not incorporate an overlay. Instead, a frame surrounding the display consists of LEDs on one side and phototransistor detectors on the other. The phototransistors detect an absence of light and relay a signal that determines the coordinates. The touch is identified and located at the point of interruption of the LED beams. Commonly used in outdoor locations, infra red touch screens are durable and can detect any input. Using optical sensors to recognise the touch, this touch screen technology is popular for its versatility and scalability. Optical imaging relies on infrared lights. Two infrared imaging sensors are positioned at the top, which double up as emitters and retro reflective tapes at the three sides. The emitted lights are reflected back to the imaging sensors, which become blocked at the point of touch and create a shadow to locate the touch. An APR touch screen is made up a glass overlay and four transducers attached to the back exterior. When the screen is touched, the friction creates acoustic waves. The transducers detect the acoustic wave, which is then converted into a signal. APR touch screens are water resistant, durable and scalable. For more information about this technology, including how it’s used in our touchscreen kiosks, please get in touch.